(Nanowerk News) A simple, ultrasensitive microRNA sensor developed and tested by researchers from the schools of science and medicine at Indiana University-Purdue University Indianapolis and the Indiana University Melvin and Bren Simon Cancer Center holds promise for the design of new diagnostic strategies and, potentially, for the prognosis and treatment of pancreatic and other cancers. In a study published in the Nov. issue of ACS Nano ("Label-Free Nanoplasmonic-Based Short Noncoding RNA Sensing at Attomolar Concentrations Allows for Quantitative and Highly Specific Assay of MicroRNA-10b in Biological Fluids and Circulating Exosomes"), a peer-reviewed journal of the American Chemical Society focusing on nanoscience and nanotechnology research, the IUPUI researchers describe their design of the novel, low-cost, nanotechnology-enabled reusable sensor. They also report on the promising results of tests of the sensor's ability to identify pancreatic cancer or indicate the existence of a benign condition by quantifying changes in levels of microRNA signatures linked to pancreatic cancer. MicroRNAs are small molecules of RNA that regulate how larger RNA molecules lead to protein expression. As such, microRNAs are very important in biology and disease states. "We used the fundamental concepts of nanotechnology to design the sensor to detect and quantify biomolecules at very low concentrations," said Rajesh Sardar, Ph.D., who developed the sensor. "We have designed an ultrasensitive technique so that we can see minute changes in microRNA concentrations in a patient's blood and confirm the presence of pancreatic cancer." Sardar is an assistant professor of chemistry and chemical biology in the School of Science at IUPUI and leads an interdisciplinary research program focusing on the intersection of analytical chemistry and the nanoscience of metallic nanoparticles. "If we can establish that there is cancer in the pancreas because the sensor detects high levels of microRNA-10b or one of the other microRNAs associated with that specific cancer, we may be able to treat it sooner," said Murray Korc, M.D., the Myles Brand Professor of Cancer Research at the IU School of Medicine and a researcher at the IU Simon Cancer Center. Korc, worked with Sardar to improve the sensor's capabilities and led the testing of the sensor and its clinical uses as well as advancing the understanding of pancreatic cancer biology. "That's especially significant for pancreatic cancer, because for many patients it is symptom-free for years or even a decade or more, by which time it has spread to other organs, when surgical removal is no longer possible and therapeutic options are limited," said Korc. "For example, diagnosis of pancreatic cancer at an early stage of the disease followed by surgical removal is associated with a 40 percent five-year survival. Diagnosis of metastatic pancreatic cancer, by contrast, is associated with life expectancy that is often only a year or less. "The beauty of the sensor designed by Dr. Sardar is its ability to accurately detect mild increases in microRNA levels, which could allow for early cancer diagnosis," Korc added. Over the past decade, studies have shown that microRNAs play important roles in cancer and other diseases, such as diabetes and cardiovascular disorders. The new IUPUI nanotechnology-based sensor can detect changes in any of these microRNAs. 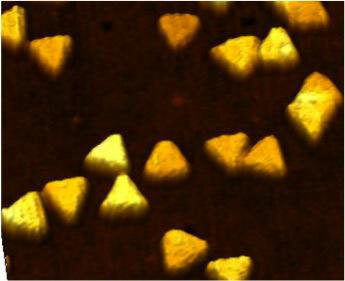 The sensor is a small glass chip that contains triangular-shaped gold nanoparticles called 'nanoprisms.' After dipping it in a sample of blood or another body fluid, the scientist measures the change in the nanoprism's optical property to determine the levels of specific microRNAs. "Using gold nanoprisms may sound expensive, but it isn't because these particles are so very tiny," Sardar said. "It's a rather cheap technique because it uses nanotechnology and needs very little gold. $250 worth of gold makes 4,000 sensors. Four thousand sensors allow you to do at least 4,000 tests. The low cost makes this technique ideal for use anywhere, including in low-resource environments in this country and around the world."